i do not smoke, but those pipes sure look beautiful and almost tempting. Enjoy, James. That works for me, James. Another non-smoker here but I was struck by the beauty of your pipe and the photograph, as well. I believe Johnny smokes a pipe and there may be a couple of others, too, so you may yet hear from them. Enjoy. Beautiful pipe. I once smoked a pipe years ago and really enjoyed it. 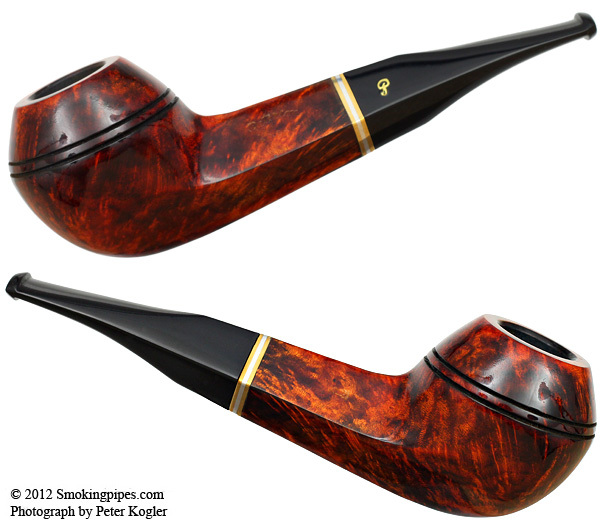 I like to enjoy a pipe on occassion, though I do not have mine with me at the moment to help contribute to this thread. My favorite tobacco so far has been McClellends Darkest Caramel. Very wonderful room aroma and a smooth smoker. James, i am sure you are not the only pipe-smoker, here. Keep posting those pictures as i really love pipes and the smell of the burning tobacco. (07-15-2012, 08:22 PM)Tonality Wrote: I like to enjoy a pipe on occassion, though I do not have mine with me at the moment to help contribute to this thread. My favorite tobacco so far has been McClellends Darkest Caramel. Very wonderful room aroma and a smooth smoker. (07-15-2012, 08:38 PM)celestino Wrote: James, i am sure you are not the only pipe-smoker, here. Keep posting those pictures as i really love pipes and the smell of the burning tobacco. "the Pipe Walk, a pointless and uninformative review"
Nice one, James! I felt as if I was taking that walk with you. Of course, you would know I'd pick up on the tea. I haven't had silver needle in a while but honestly don't remember it being a favorite. Dug around, here's a pic of my current pipe. French made Jeantet Signature Flamme Select if picked up on ebay is very nice condition. Smokes great and has a very large bowl for a nice long smoke. yes ! i have a partner in crime now ! Only somewhat, I won't be able to smoke it again until I'm back in NM. Nice looking pipe there, Anthony. Enjoy. Well sir, I am a pipe smoker. I've been smoking a pipe for the past 50-years. I started out on cobs and Kaywoodies like my Dad use to smoke and Sir Walter Raleigh pipe tobacco. Over the years I've smoked just about every kind and brand of pipe out there and most of the tobaccos, both mass produced and custom blended. Five years ago I had over 300 pipes, ten pipe racks/stands, several cabinets custom made for my smoking pleasure. My habit had become an overblown hobby that I simply could no longer afford after retirement, so I sold almost everything I had. I now have just six pipes. All are billiards made by either Dunhill or Ashton. They are all small pipes, about a Dunhill Goup 2 or small 3 or the Ashton single X. Three have a smooth finish and three have the sandblasted finish. My tobacco of choice for the past ten years has been good old cheap Prince Albert which I buy from Iwan Ries & Co. in Chicago. I'm puffing as I type.